Congress. House Committee on the Judiciary. 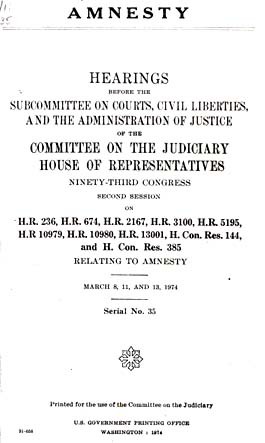 Subcommittee on Courts, Civil Liberties and the Administration of Justice. Amnesty. Washington, D.C. GPO, 1974. Not only did African-Americans suffer a disproportionate share of the burdens during the Vietnam War, (higher casualty rates, lack of promotions, discrimination on and off military bases, more dangerous and menial duties) but they also continued to suffer after the war through other-than-honorable discharges. About 24% of the other-than-honorable discharges dispensed in Vietnam were given to non-whites. Many discharges could be given without due process, and were used by many military commanders to get rid of "trouble makers" at a time when the U.S. military force in Vietnam was being reduced. In fact many of these commanders offered these discharges as a way for the soldier to avoid a court martial (and for the military to avoid the cost of conducting one). However, few of these soldiers knew that these labels would stick with them for life. Even fewer knew that employers could have access to their Separation Program Numbers (SPN's), which included such categories as "41E Obesity," and "461 Inadequate Personality." Depending on the exact type of discharge, anywhere from 15% to 43% of employers and colleges would reject these applicants automatically. These hearings, held in March of 1974, present testimony from Trudi Young, National Coordinator of the Clergy and Laity Concerned about Vietnam (formerly headed by Martin Luther King, Jr.), Ronald H. Brown, Director of the Washington Bureau of the National Urban League, U.S. Representative Ronald V. Dellums of California, and various African-American veterans who were affected by other-than-dishonorable discharges.